Not wanting to lose a great opportunity to pick the brain of one of the most knowledgeable people in the sport, I asked Simon if he would mind answering some questions. He was gracious enough to comply and did so in spades. When I first asked for an interview, Simon said, “you might want to put a word limit on my responses, I can waffle on about ‘cross for pages.” He may consider it waffling, I consider it knowledge and you should too. Simon Burney is a former professional cyclocross racer and has spent more than twenty years managing professional cyclocross and mountain bike teams, working with some of the top ‘cross racers in the world. Simon served as the Performance Manager for mountain bike at British Cycling and has raced, wrenched, or managed the national team at the Cyclocross World Championships for 28 years. Here is Part I of our interview. CXHairs: Do you come from a cycling family? BURNEY: No, I grew up in a running environment; my dad was heavily involved in athletics, he was a pretty good road runner up to marathon distance, longer distances on the track and cross-country in the winter. From as young as I can remember I was hanging round at running events every weekend, started competing myself as soon as I could, and ran at school. By the time I was 15 or 16 I had started to become more interested in cycling and it coincided with a period when my dad was injured and was out of running so he was taking me to cycling races instead, and he actually ended up switching sports himself. He has been a race organizer for 30 years now and is still involved in the British National Trophy ‘Cross series organization, in his seventies. I guess sport is sport, and once it’s in your life it’s hard to do without it, and circumstance decides which sport you end up in. CXHairs: When did you start riding and when did you start racing? BURNEY: I started riding when I was around 15. A guy called Sid Standard had a bike shop in my local town and I was obsessed with bikes and parts, so spent all my time and money in there. Sid took a group out every Sunday for the Cyclists Touring Club (CTC) which has a great tradition, and his “Junior” runs became legendary and introduced so many youngsters to cycling, many of whom became professionals and Olympic medalists. I started racing time trials when I was 15 because they were regular, local, and easy to get into, road racing and cyclocross soon followed, but ‘cross had an instant connection with me, probably because of my background cross country running. Any excuse to play in the woods and get dirty! CXHairs: How did you get involved in cyclocross? Was cyclocross your main focus? BURNEY: When I was a Junior category rider I just raced anything I could, on the road in the summer, ‘cross in the winter, and didn’t really have a focus. I was OK but not great, but in my late teens ‘cross started to click and became the focus. CXHairs: To be in the pro ranks you were obviously a great racer. Brag a little about your career. BURNEY: I was never a great racer, I was OK in a country that had a pretty low standard of competition! Every now and then a rider would perform at the Worlds, and there was a small number of professional riders who I grew up respecting, and one of them, Eric Stone, persuaded me to turn pro whilst we were on a GB Team trip to a race in France when I was 20. I had just left working at Raleigh to open a bike shop so it seemed like a good way to publicize the shop and I knew that I wanted to give ‘cross the best shot I could. Remember back then there was no U23 category, it was Am and Pro, so I figured why not? I got enough sponsorship to cover all the costs and make a few quid, and off I went! My career was pretty short and sweet; I finished 4th at the National Championships in 1983 and was selected for the Pro Worlds in Oss, Holland where I finished 24th. I missed Worlds the following year as I was injured but that was a relief as it was on the ice at Munich and I hated racing on ice. My best overseas results usually came in France, and I really liked the courses there. Hillier and more varied than Belgium at the time, and I loved racing in Switzerland which at the time was like Belgium is now; all the best riders and races. I was a lot better when it was hilly, muddy and generally a bit slower, and I didn’t mind running at all. CXHairs: Your book preaches technique as key to success in cyclocross. When you were racing, did you appreciate the importance of ‘cross specific skills to save seconds and put yourself in a winning position, or did you tend to rely on your strength as a rider? BURNEY: Technique was important, but specific fitness much more so on the kind of courses we raced on back then. I trained a lot with Tim Gould and David Baker who became great riders on both ‘cross and mountain bikes, and we rode off-road a lot but never really concentrating on technique, it was just part of the session. I studied the best continental guys a lot though and do remember deciding to switch dismount and carrying styles mid-season one year so spent a lot of time getting that dialed. Courses have become quite dumbed down in recent years, with less dismounting and less running generally, so the techniques and training have changed in line with that, so it’s quite hard to compare the different eras. CXHairs: Some professional athletes go out with a whimper, you seem to have gone out with a bang. Tell us how your racing career ended. BURNEY: Oh, mine ended with me whimpering like a baby! It ended in a muddy puddle next to a set of barriers at a local race in Sheffield. There was quite a fast downhill approach to some hurdles and it was raining and muddy and as I jumped off, my left foot just slid into the barrier and I fell over it and twisted as I’d got my bike in the air, and I snapped every ligament in my left knee. Every single one; nothing connecting lower leg to upper leg. I had three weeks in hospital and a re-build, then another reconstruction around 18 months later. I was 25 at the time and felt like I was still learning, so it was disappointing to finish like that. I guess I needed longer spikes in my shoes! CXHairs: It certainly looks like you have made the best of a wretched situation. It must have been tempting to say the hell with it and leave the sport behind. Why did you decide to stay involved? BURNEY: It never occurred to me not to stay involved, in fact until you asked me the question I had never thought about the fact there might have been an alternative! Everything I did was about the sport, all my friends were in it, and it was my job and I still had my bike shop business, so there was never a fleeting moment when I was going to walk away. It also coincided with the time that Baker and Gould were becoming really good and we had put a small team together, so it was quite natural to spend more time on that, and grow the team as they became world class riders. I guess I was in the right place at the right time with the right guys on my team, as with them we started a great professional mountain bike and ‘cross team and twenty years later I’m still working in the same environment. CXHairs: One thing that I believe we share is that our minds are willing but our knees are weak. If you successfully undergo knee replacement surgery would you ever consider jumping into a race? I know in this region there are a couple guys getting results with artificial hips and knees. 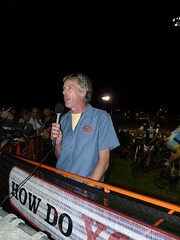 BURNEY: I have raced occasionally since; I even raced at the first ever UCI ‘cross race in the US, in Boulder in 1997! Well, I raced Masters, but I had taken Peter Van den Abeele over who was racing for my team at that time. 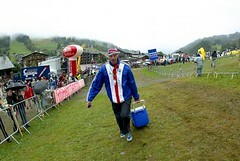 He won that race and he is now the UCI boss of ‘cross and mountain bike. He rode for me for four years. I think I finished fourth, but remember thinking even then that the level of Masters racing was pretty good. I would have raced more but I was usually at a race working for a team or with riders so it never really fit to have another go at racing properly, it would have had too much impact on my day job. I’m over at the USGP races this winter so if I get an opportunity I might bring a bike over and have a go. CXHairs: Tell us about managing the British cyclocross and MTB teams. That has to be a great experience working with such incredible athletes. BURNEY: The best experience I’ve had of working with athletes was in pro teams, not the GB team. That is not belittling the GB riders I worked with, just that the Pro’s I worked with were the nicest, most professional group of guys possible and I loved every second of working with them. I worked with Henrik Djernis for three years, and he was a great ‘cross rider who became a great mountain biker. After him I worked with Peter Van den Abeele, Beat Wabel and Dominique Arnould on the same team at the same time. What's in the cooler Simon? "personal stuff to get me through two hours in a feed zone; magazines, sweets, dvd player, that sort of thing!" Peter was Belgian Professional Champ, Dominique had won a Tour stage and the Professional ‘Cross Worlds, Beat had been Junior World ‘Cross Champ, second in the Elite Worlds and finished top 10 at Worlds pretty much every year for ten years. We had a blast, especially racing in America which they loved. I worked for British Cycling for eight years as the Performance Manager for off-road, but ‘Cross isn’t Olympic funded so there was not too much I could do there with little budget. The great thing about that time was being involved as Dave Brailsford built the team and infrastructure that has recently started to produce such great results on the track and now the road, so I learnt a hell of a lot about performance planning. CXHairs: Was Roger Hammond on any of the squads you managed? He is one of my favorite racers and was super nice to my four year old daughter before the 2008 CSC Invitational in Virginia. BURNEY: I was managing the British Pro riders at his first Worlds in Gieten in ’91 and then the Leeds World Champs in ’92 when he won the junior race so I’ve known him since he was a kid and he’s had a great career and is a great guy. 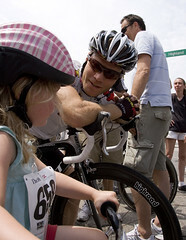 Roger and me: Lily gets some last minute instruction before the 2008 CSC invitational kid's race. When he won at Leeds we were all set for a big night out to celebrate but he had an exam at school at 9am the next morning so he had to go home which was a bit of a downer, but Mike Kluge was in our hotel and he had won the pro race so we took him out instead! So Roger still owes me a party…. Thanks for reading. Please check back in a day or two for Part II of our chat with Simon Burney. I think about cross everyday I wake up. I still cannot believe how much fun I have when I do a cross race. I continue to monitor the cyclocross blogs during the off season, see who is doing a local mtb race (see Tim Johnson’s interview on Cyclingdirt.com) or road race; it keeps it fun. I also start dreaming about the build that I will have for next season. Pick up a Gucci part here and there to make the bike that much more fun to ride. That is my motivation. Keep on seeking out the good stuff like this with Mr. Burney. Also Jonathan Page was on the 7am ride this weekend and will be racing with the Harley Boys…its always an interesting read with Jonathon does an interview. JP is one of the nicest guys around….track him down at CSC or Air Force race. Good luck and stay off the donuts as fall is near and they are a lot harder to work off than they are to shove down your gullet. I enjoyed the interview. Roger Hammond is a nice guy. I met him briefly at a big old crit in Newcastle. Previous Previous post: What’s My Motivation?